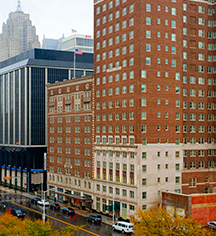 In the heart of the Motor City, DoubleTree Suites by Hilton Hotel Detroit Downtown - Fort Shelby is a historic gem that is a renowned property for its numerous visitors. Dating back to 1917, the hotel is listed on the National Register of Historic Places and has remained a premier destination for travelers looking to immerse in Detroit Michigan's historical splendor. Boasting 203 suites, the historic Michigan hotel promises spacious accommodations, onsite activities, and plentiful dining options for its visitors to enjoy during their stay. Guests are only steps away from Detroit's coveted destinations, including sports stadiums, historic attractions, museums, and iconic music venues. With an intriguing story behind its name, the hotel leaves a legacy that can still be enjoyed today by guests who long to hear the tale. Hilton Hotel Detroit Downtown - Fort Shelby, a member of Historic Hotels of America since 2015, dates back to 1917. The hotel's name stems from a Colonial-era fort that dates back to the 18th century. Early Check-In/Late Check-Out: Early Check-In Fee: $25.00. Early Departure Fee: $75.00. Reservation rate based on minimum length of stay may not depart early. Late Check-Out Fee: $75.00. After 2pm, a full night rate applies. Parking: Self-parking: Not Available. Valet parking: $30.00 Per day charge. Secured: Available. Covered: Available. In/Out Privileges: Available. Payment: All forms of payment are accepted. Payment is required at time of booking. Visa, MasterCard, Amex, Diners Club, China Union Pay, JCB, Carte Blanche, and Discover are accepted. Shuttle Service: Free area shuttle within 3 miles. 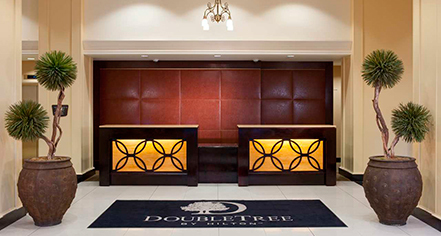 In the heart of the Motor City, DoubleTree Suites by Hilton Hotel Detroit Downtown - Fort Shelby is a historic gem that is a renowned property for its numerous visitors. Learn more about the History of DoubleTree Suites by Hilton Hotel Detroit Downtown - Fort Shelby .